Say what you will about metalcore, but there is no denying its popularity. Despite tonight’s show being in the modest-sized Underworld, the turnout is impressive, and must be close to, if not at, capacity. Tonight’s tour package contains some of the most touted bands in the genre, and the first dates in the UK for two of the bands. Despite being largely under the radar on these shores, Pennsylvania’s This Or The Apocalypse start proceedings in enthusiastic fashion. Frontman Rick Armellino, is clearly having the time of his life, bounding around the stage like a mutant Tigger, riling up the crowd in to some kind of warped aerobics routine. The band gives everything, and their take on metalcore is enhanced as a result. The size of This Or The Apocalypse’s UK fanbase certainly increased tonight. The reception that greets Fearless Records’ The Word Alive suggests that this, their debut UK jaunt, is long overdue. From the opening chords of ‘The Hounds Of Anubis’, the floor of the Underworld explodes. Bodies fly, and the stage is regularly invaded throughout the bands set. Led by the enigmatic and powerful voices of frontman ‘Telle’ Smith and the raw screams of guitarist Zack Hansen, the crowd are like a choir rasping back every word of tracks such as ‘The Wretched’ and ‘Like Father Like Son’ in rapturous unison. Their triumphant set is crowned with a powerful rendition of the hate-filled anthem ‘2012’, and the zealous reaction of the crowd suggests that the band can’t return soon enough. Ohio’s Miss May I are certainly one of Rise Records’ leading lights at the moment and judging by the amount of merchandise shifted before they take to the stage, their star is definitely on the rise in the UK. Falling on the more metal side of the spectrum, the guitarwork on songs such as opener ‘Monument’ and old favourite ‘Forgive And Forget’ is exemplary, and frontman Levi Benton definitely puts every ounce of energy into his guttural roar and stage presence. That said there is something about the band’s performance tonight that feels lacklustre. Whether it’s the disappointing reliance on a vocal track for the cleaner vocals or whether they just fail to match the intensity of the previous band, by the time they leave the stage you can’t help but feel underwhelmed. 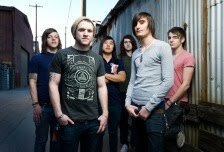 The audience seems to switch shifts before We Came As Romans take to the stage, with the majority of the floor emptying and then filling back up with new faces. There is certainly an equal sense of anticipation for the headliners, but from the opening notes of ‘Roads That Don’t End…’ it’s clear that something is not right. Whilst growler David Stephens dominates the stage and does everything he can to relate with the audience, clean vocalist Kyle Pavone looks distant and uninterested, as well as being vocally weak, straining for every note. Pavone’s poor vocal performance hinders the band as a whole, and things plummet further when the band roll out a cover of Justin Timberlake’s ‘My Love’. The cover is beyond awkward and is responsible for three cringeworthy and muted minutes. The band redeem themselves slightly during heavier tracks like ‘Broken Statues’, but despite the mass stage invasion for closer ‘To Plant A Seed’, there is a general sense that this was far from being the bands best performance.